We just got back to California from a trip to Central Florida to visit James’ parents. We spent most of our time visiting the theme parks in the area, being something that we thoroughly enjoy (as can be further evidenced by our trip to Disneyland Paris, and our love for Disneyland). Here are some photos from our trips to Florida over the past few years. For me, the differences between the Florida parks and those in Southern California were a bit strange but wonderful at the same time. When I first stepped into the Magic Kingdom, I was blown away by the view looking down Main Street, U.S.A. toward Cinderella Castle. 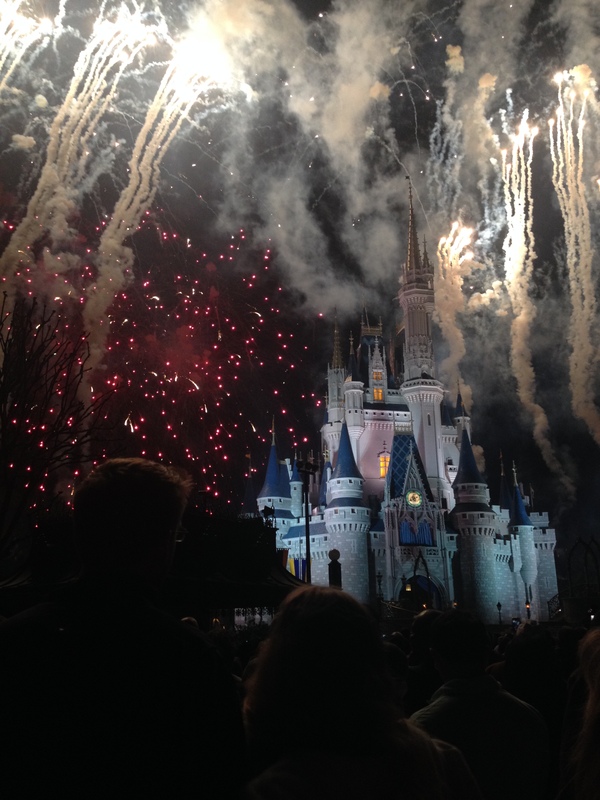 The small differences in the Magic Kingdoms in particular are so interesting to compare. Casey’s Corner is an example of a slight twist of what I am used to at Disneyland here at home. On our first trip to Florida, we attended Mickey’s Not-So-Scary Halloween Party. Here we are riding Buzz Lightyear’s Space Ranger Spin while dressed up as Constance the bride and one of her decapitated husbands from the Haunted Mansion. These Tangled themed bathrooms now stand where the Fantasyland Skyway Station once stood. It was one of James’ favorite parts of Fantasyland, but we do both love this rest area despite what was demolished to build it. There is constant construction at Disney parks, and in my few trips I have already seen massive changes. Who could have guessed when I peeked through this window last year that Seven Dwarfs Mine Train would turn out to be my favorite ride in the Magic Kingdom! All of New Fantasyland was under construction on my first visit. Of course, I had no conception of what things were like before that construction started so it has all felt seamless, but James is still getting used to the new layout after years of visiting. The moat around the hub was drained to start a large renovation. 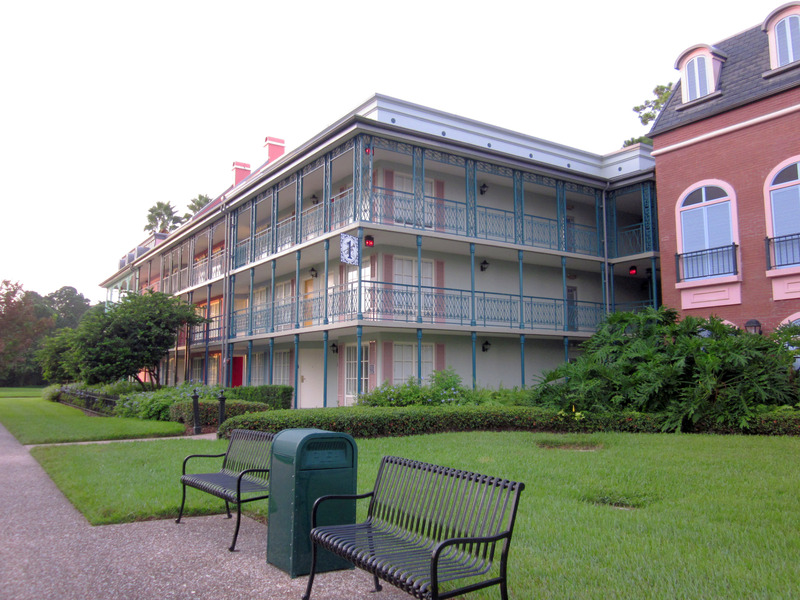 One of the casualties of this renovation was the Plaza Swan Boat landing dock. James never rode the Swan Boats, as they have been gone for decades, but this forgotten structure was another one of his favorite quiet spots around the park. It’s so exciting to see the finished result of all the construction when we come back on later trips. I absolutely fell in love with the Be Our Guest Restaurant’s elegance and immaculate details from Beauty and the Beast. We can ride The Little Mermaid: Ariel’s Undersea Adventure whenever we want at Disney California Adventure, but we have to come to Florida to walk through this amazing queue with Prince Eric’s castle. 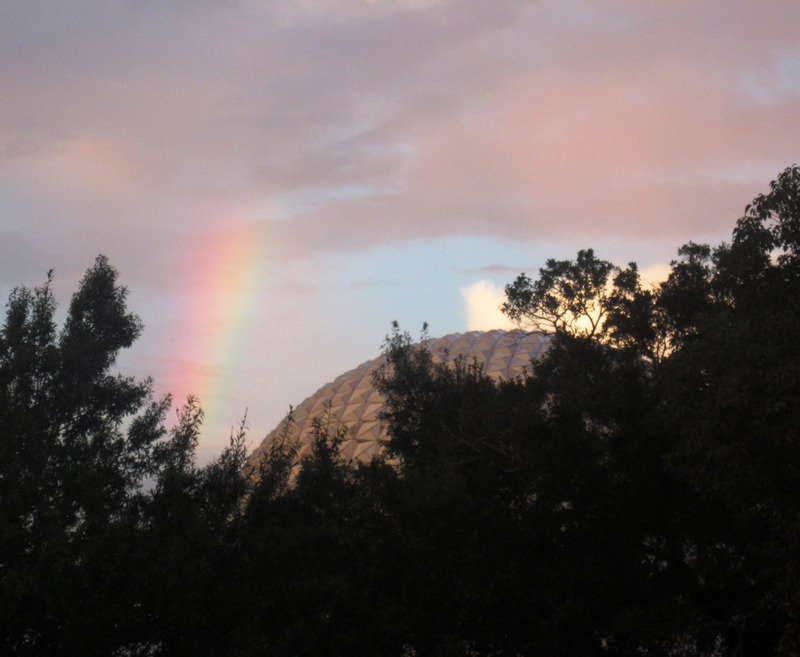 James did his best to explain to me how great EPCOT Center was, but I did not fully grasp how wonderful Epcot would be until I was there myself. Even though it has been undergoing a severe identity crisis for decades now, it still manages to inspire a first time visitor. The day of my first visit coincided with the 30th anniversary, and we were able to see a presentation by people who worked on the park including Disney Legend Marty Sklar. 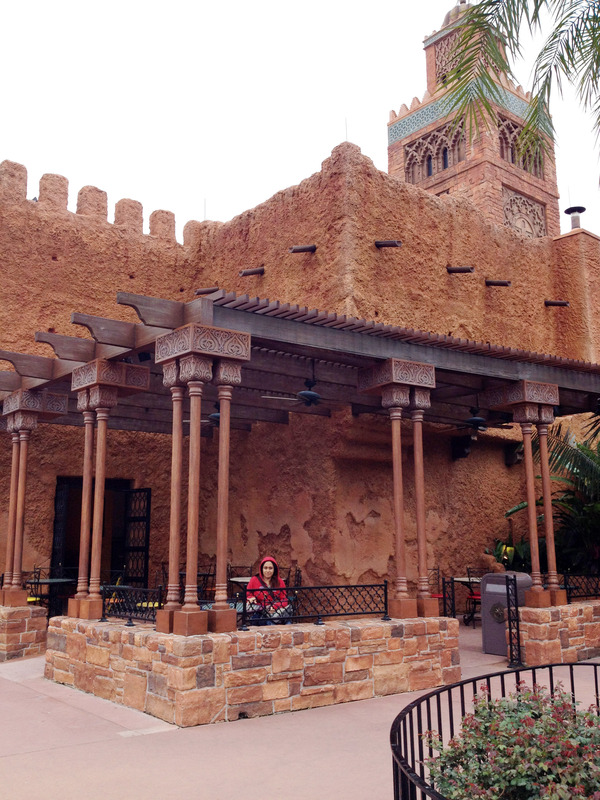 The Morocco Pavilion is perhaps the most expansive pavilion in World Showcase, and one of our favorites. You can really lose yourself in the alleyways and courtyards. This map was a main feature of the queue for Maelstrom in the Norway pavilion before it was very sadly closed to build a Frozen attraction. 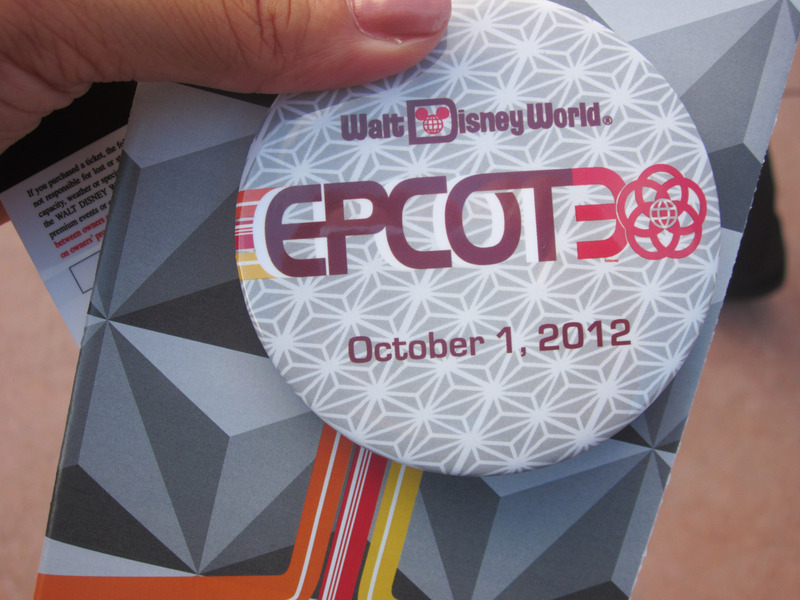 We have visited Epcot during both the International Flower and Garden Festival and the International Food and Wine Festival. 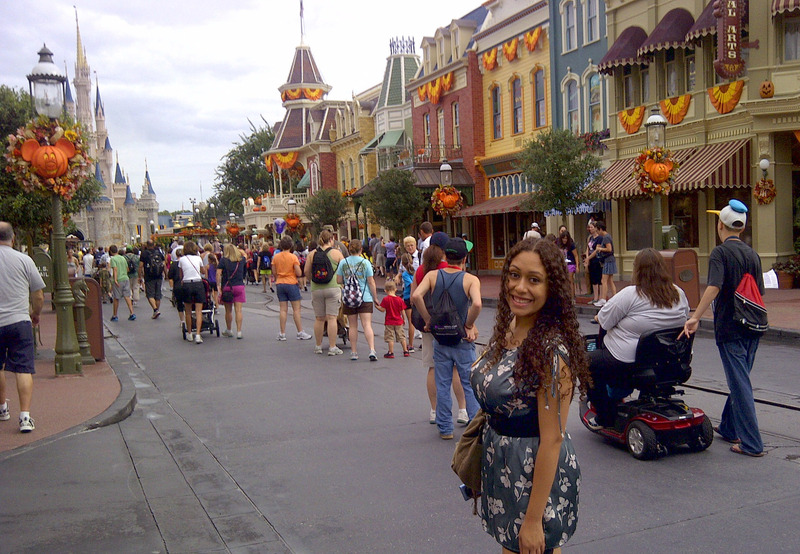 The first time we went to Florida together, we stayed at Disney’s Port Orleans Resort French Quarter. James was so excited to show me all of the hotels on Disney property. 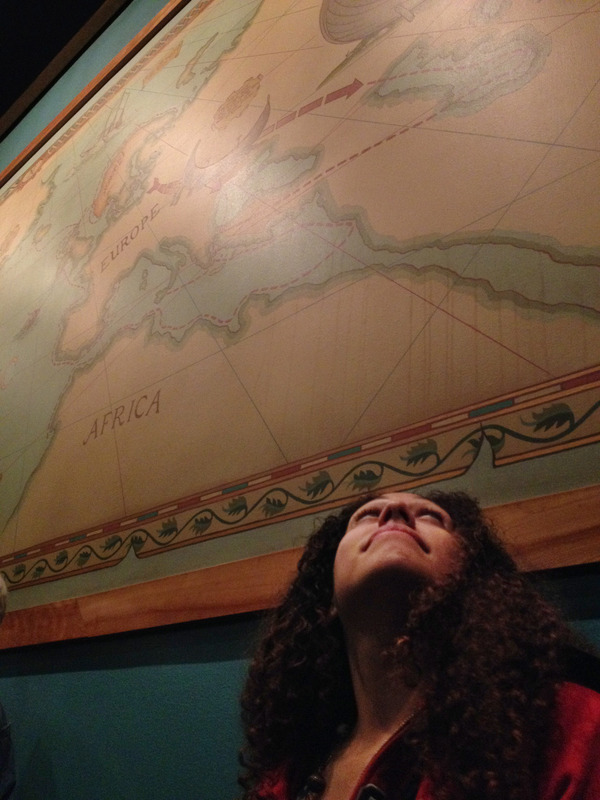 I couldn’t believe that there were so many worlds to explore! We like to stay at different hotels each time to fully enjoy each one. 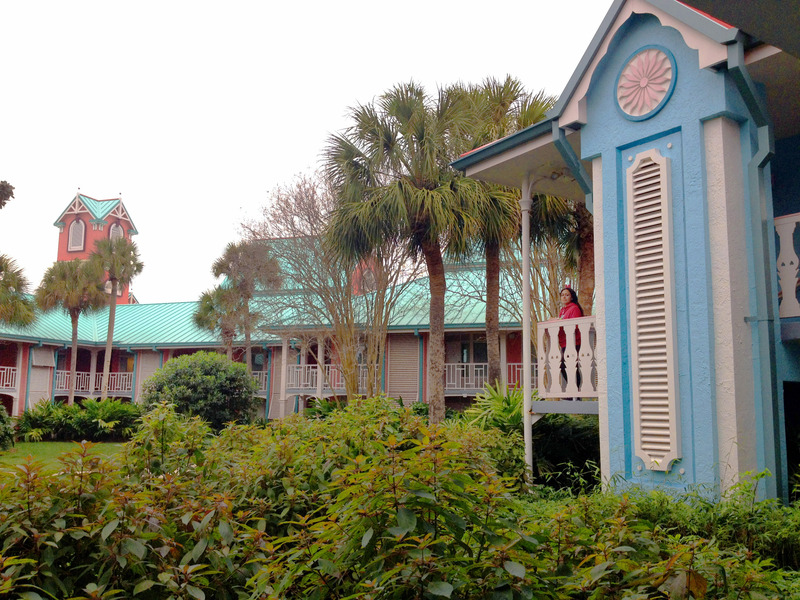 Here I am outside of our room at Disney’s Caribbean Beach Resort. Universal Orlando doesn’t quite have the ‘Disney Difference’ but The Wizarding World of Harry Potter comes very close. 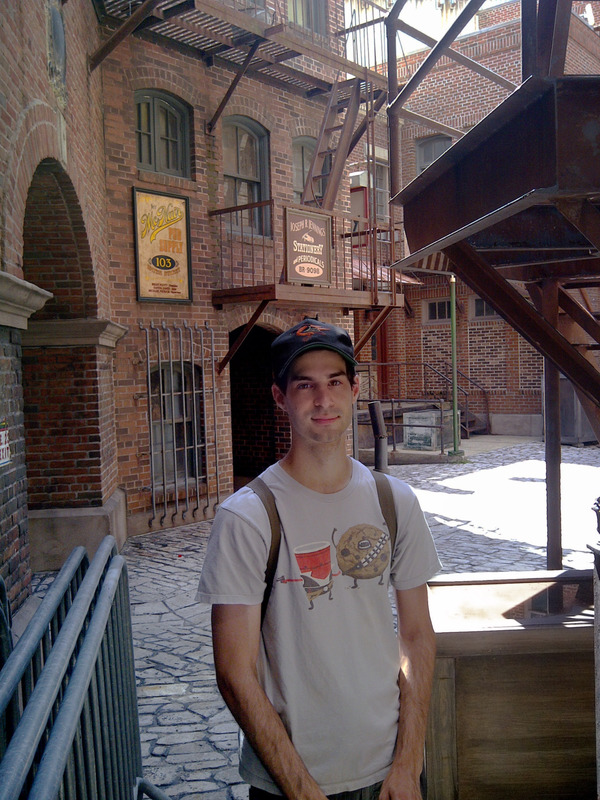 As a fan of the books, I was all too eager to explore both Hogsmead and the new Diagon Alley. 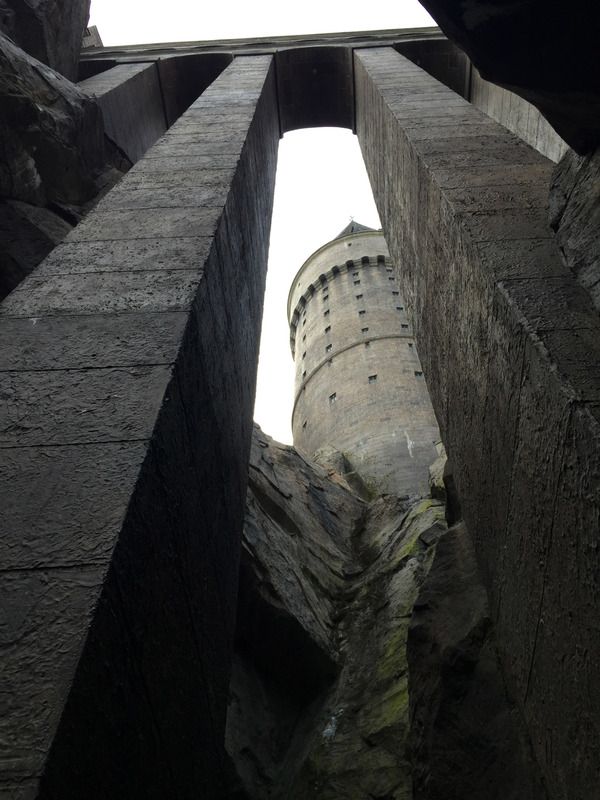 Here is an amazing forced perspective view of Hogwarts. This network of alleys at Universal Studios Florida is a holdout from its days as a functioning backlot. Just a short distance away from cash grabs that capitalize on current hits, you can still escape into this world dripping with atmosphere, where around any corner you may run into a gang of bootleggers loading up crates of moonshine. 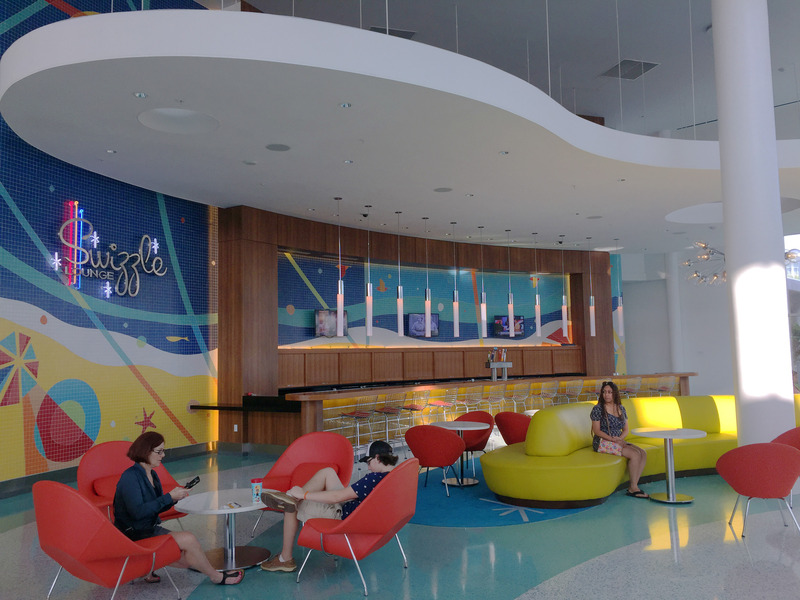 On our most recent trip, we stayed at Universal’s newly constructed Cabana Bay Beach Resort. It is the perfect mid-century modern Florida experience. 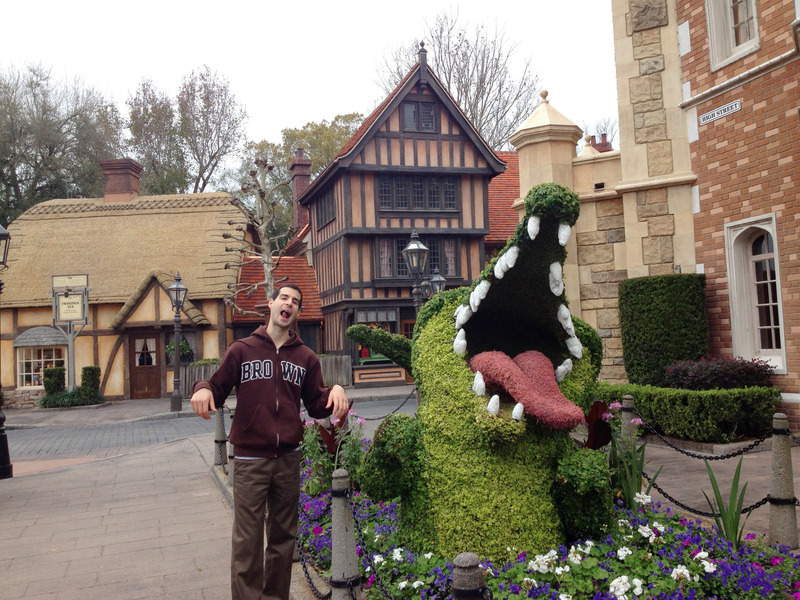 There are still plenty of attractions in Central Florida that I have not seen, not to mention revisiting my favorites. 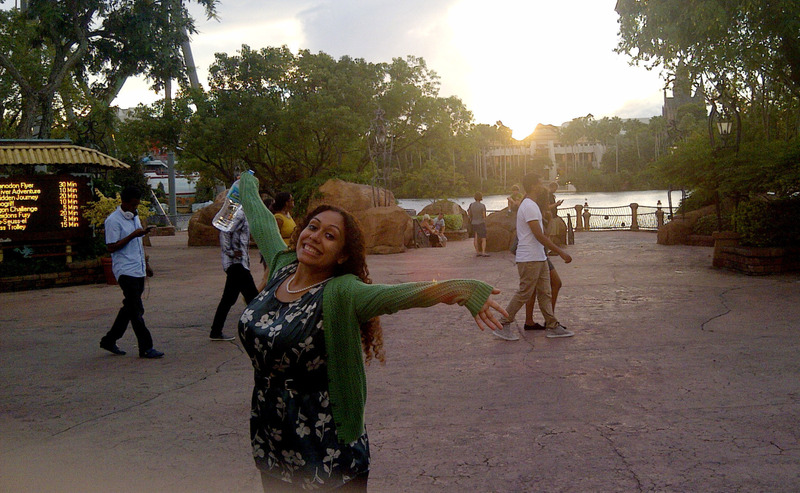 I know that we will be taking many trips in the coming years, and I look forward to enjoying new adventures at the Walt Disney World Resort and Universal Orlando. 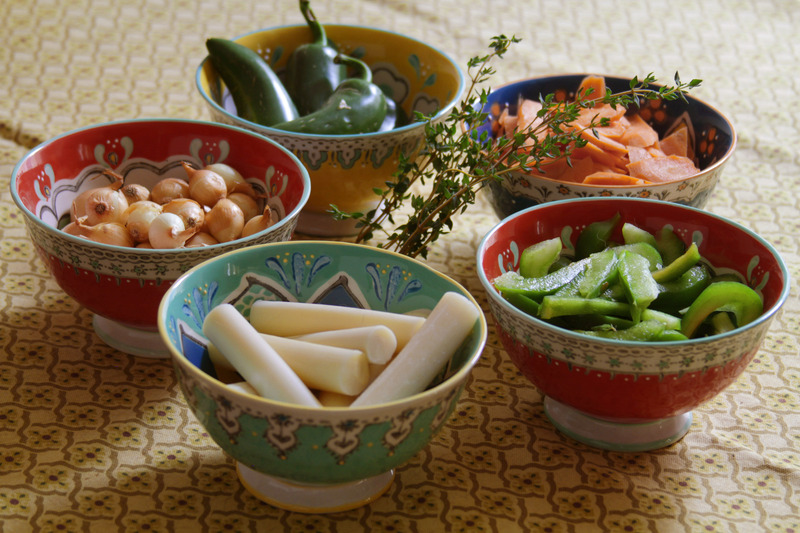 This recipe for pickled spicy vegetables is a staple in my parents’ restaurant as well as their home. 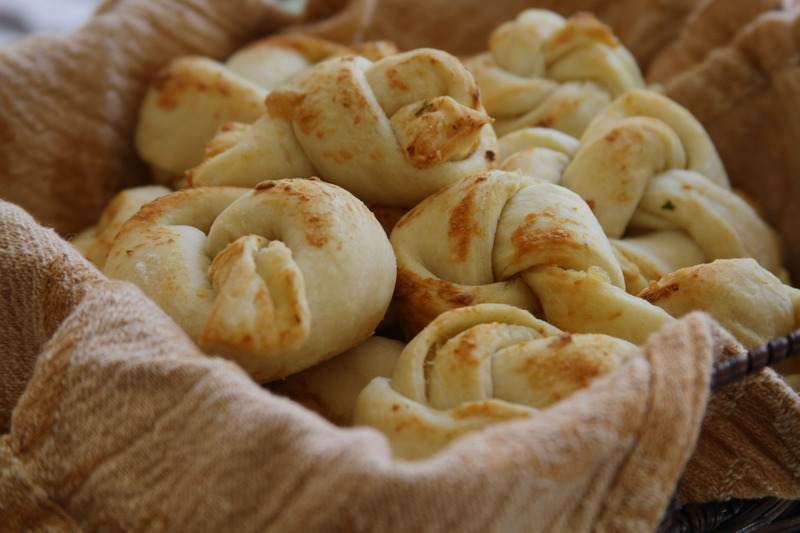 They are a fantastic addition to just about any savory meal, and they’re also great on their own. Ingredients: 3 sliced jalapeños, 2 sliced large carrots, 1 sliced green bell pepper, 1 can hearts of palm, 1 1/4 cup peeled pearl onions, 2 sprigs fresh thyme, 1 bay leaf, 3 minced garlic cloves, 1 1/2 teaspoons cumin, 1 1/2 teaspoons salt, 1 cup white vinegar, 2 cups cold water. Note: you can use any variety of vegetables you want, the key ingredients being the jalapeno, thyme, onions, and garlic. Instructions: place each ingredient into separate bowls, you’ll want to sauté each vegetable individually as each requires different cooking times. In a pan heat the olive oil, thyme, bay leaf, cumin, and jalapeños and sauté for a couple of minutes, enough for the jalapeños to be only gently cooked but still crunchy. Remove jalapeños from pan and repeat the process with each vegetable. 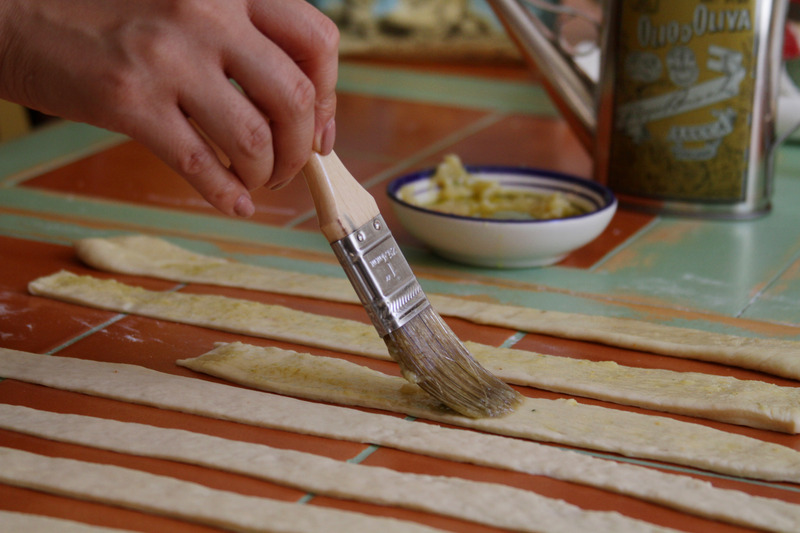 Once all of the vegetables are ready add to a jar along with the herbs, salt, water, and vinegar. 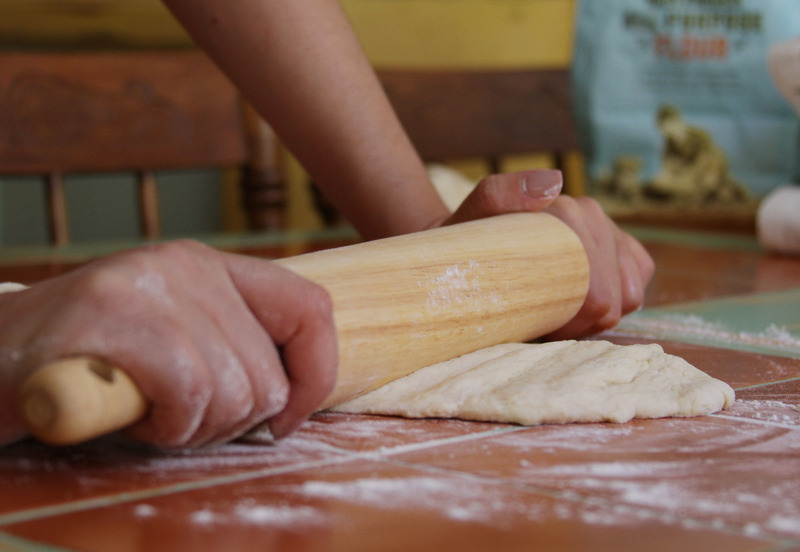 Let the ingredients cool before placing in refrigerator. 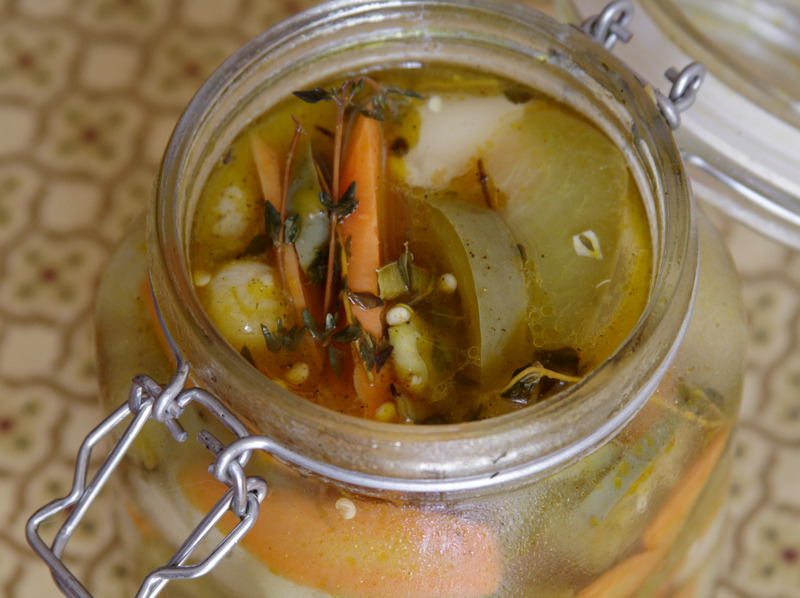 Allow the vegetables to pickle for at least 24 hours before eating, they will taste better with time. 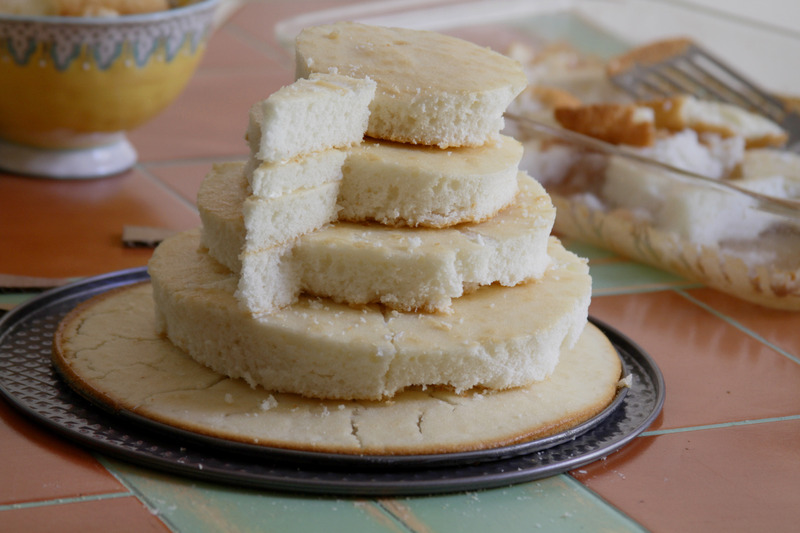 This recipe is very easy to make and it will keep in your refrigerator for weeks. Add it to any meat dish, sandwiches, even scrambled eggs to give your meals an extra kick. 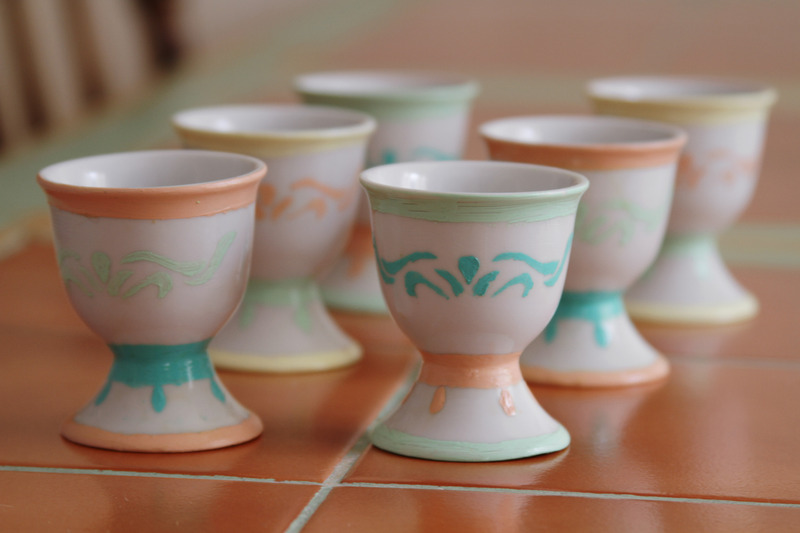 I’ve been on the lookout for egg cups for quite some time now, but have been unable to find a complete set that isn’t either plain white, or does not suit our kitchen’s color scheme. 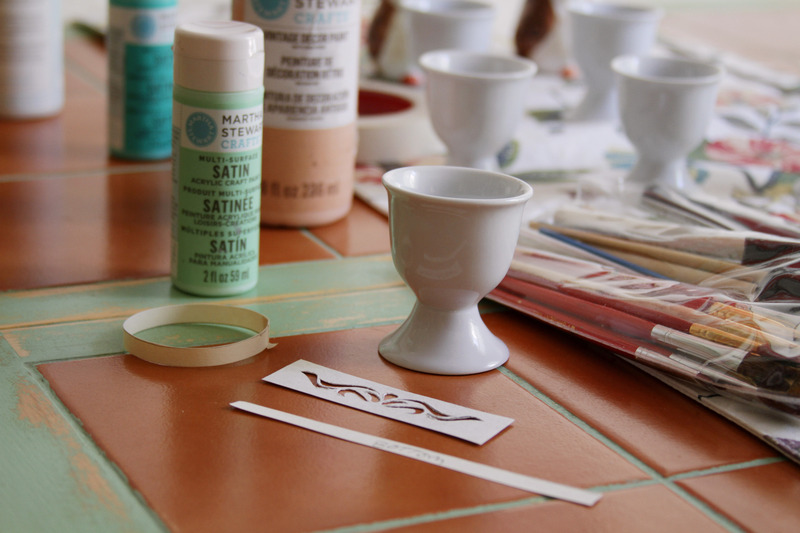 Instead of continuing the search, I decided to buy some simple white ones and paint them myself at home with some acrylic paint and clear glaze. I picked colors that matched our kitchen table and hutch, and alternated them to create three different patterns. The design on the middle part was done using a small handmade stencil. 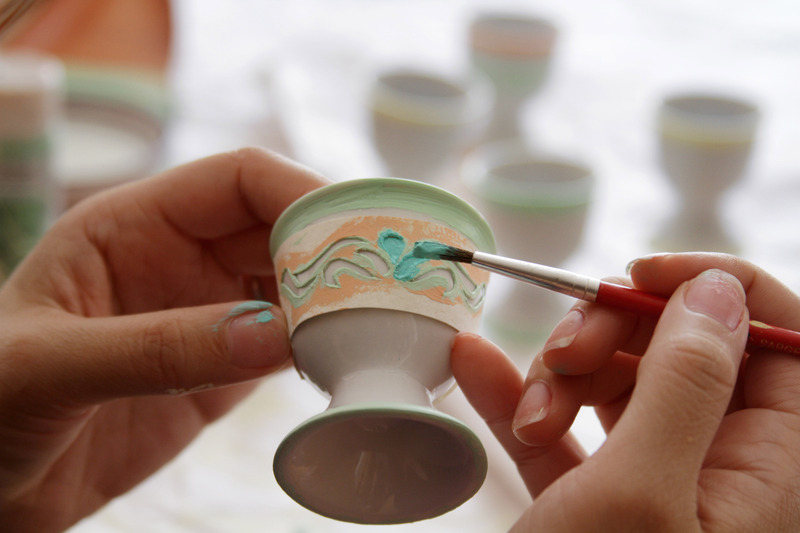 Once all of the cups were painted and glazed, I let them dry for about 12 hours and then placed them in a cool oven set to 350F for 40 minutes (the cups have to heat with the oven or the harsh temperature difference can crack the paint). 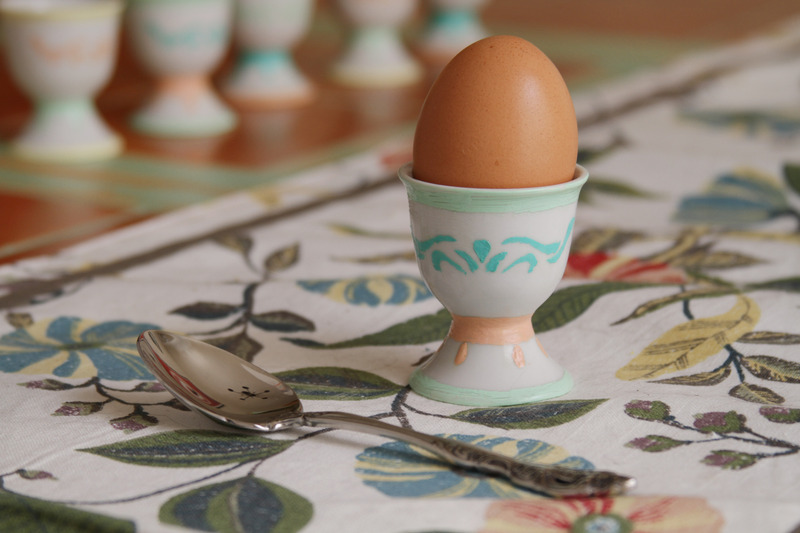 I’m very excited to have this little set and can’t wait to enjoy many warm egg breakfasts with them. As noted in a previous post, a couple of good friends of ours host a fun Lord of the Rings themed party every year right around the end of winter called Middle Earth Madness. Each year we look forward to a full day of enjoying the extended films with great company, eating fun themed foods, and creating our own contribution. 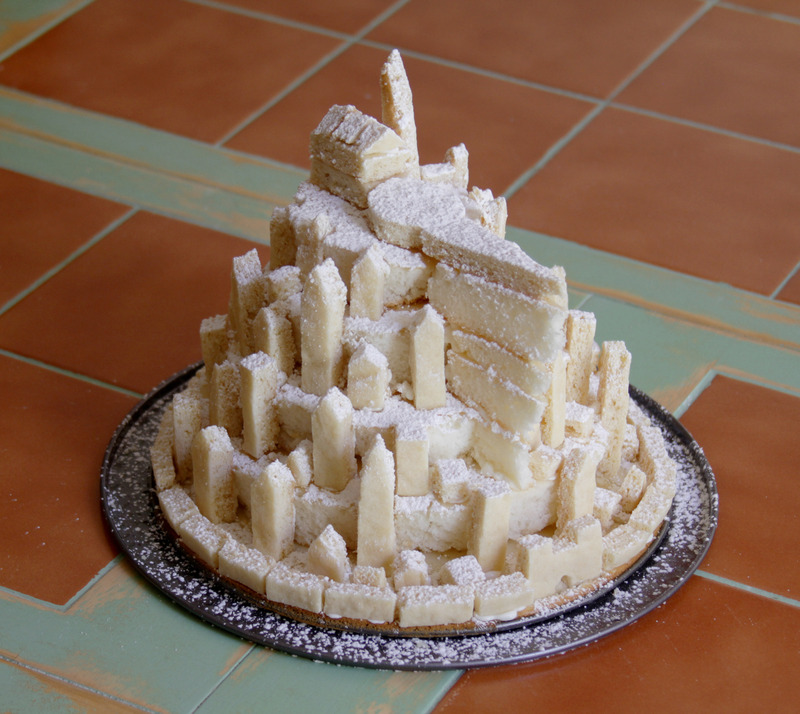 This year we decided to make a little model of Minas Tirith using white cake, sugar cookies, icing, and powdered sugar. We broke down the basic shape into cylinders and triangular prisms that were roughed out in cardboard. We used a cake mix and cookie dough out of a box so that we could focus on cutting out the shapes that we needed. The shape of the city is very conducive to a layer cake, which made it simpler to construct. The only tricky part was the wedge shaped section of rock. 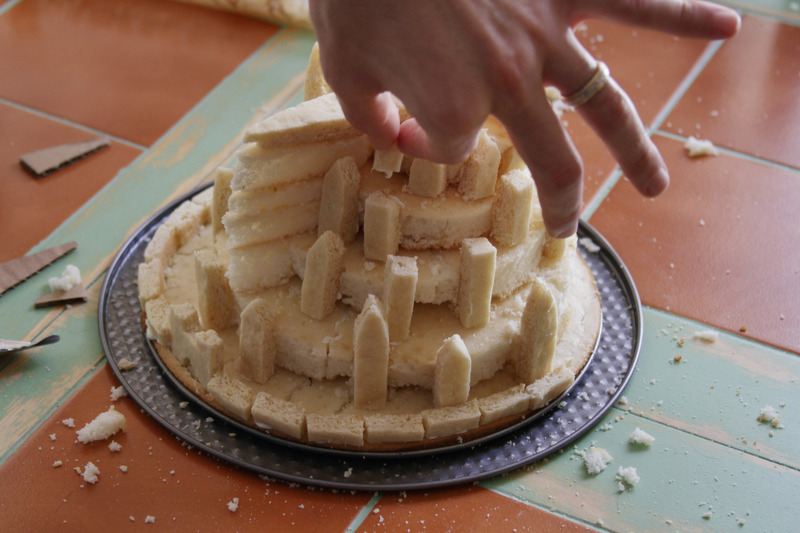 Once we had our basic structure made from the cake, we cut out quite a few buildings and towers from a cookie sheet and attached them with icing. Then we sprinkled the whole thing with powdered sugar to make it look whiter. 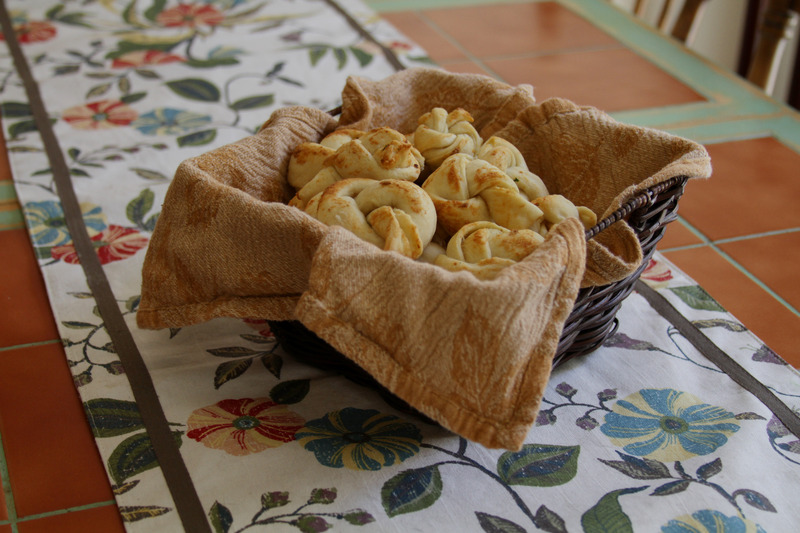 This is James’ favorite of the treats we’ve created for Middle Earth Madness so far. I’m torn between this and the hobbit hole we made two years ago. We’re not sure just yet what we’ll be constructing next year, but we look forward to thinking up of of new ideas for Middle Earth treats. In the past we’ve shown off some of our Lego creations, and since then we have built a few more. Here is a city block that is done in microscale. It’s very interesting to see what can be created with such a small amount of area. Keeping things small, this home interior is equipped with tables, chairs, a TV, and a stove. Maybe the bathroom and bedroom are on the unseen second floor. This church is pretty much done to minifig scale. Here’s another one in scale with minifigs. This is based on the city gates that we saw in Vieux-Québec. Every once in a while, we will look to inspiration from the photos we took on a trip to Legoland California a few years ago. We never really have enough pieces to think on a grand scale, and we always have to work in white because our color options are extremely limited, but I’m sure our collection will continue to grow. Perhaps one day we can create something like the masterpieces below.